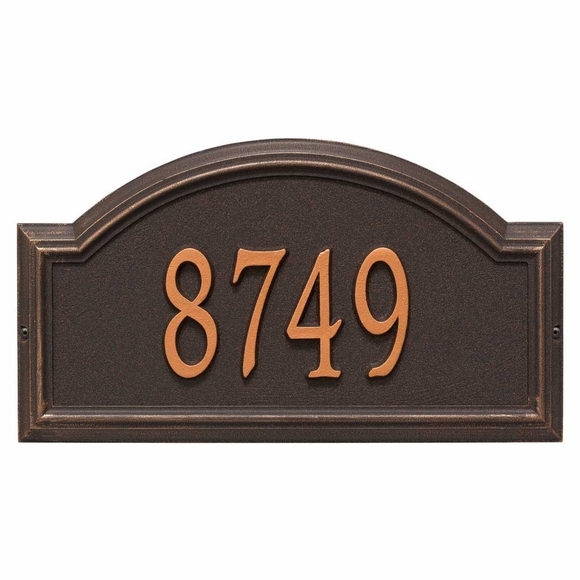 Whitehall Providence Arch Address Plaque Oil Rubbed Bronze - - personalized address sign includes your address number. Free personalization. Made in USA. Wall mount house sign. Upscale oil rubbed bronze finish. Holds up to five (5) 4" numbers. The decorative dimensional border provides a distinctive appearance that showcases your entryway. Enhances curb appeal while adding value to your home. Personalization is permanently cast into the sign. Dimensions: 17"W x 9.5"H x 1.25". Color: oil rubbed bronze finish. Providence Arch Address Plaque Oil Rubbed Bronze -- add this beautiful home address plaque to your list of gift ideas for any occasion.